Diglo is a Chromium based web browser with highly customization features. 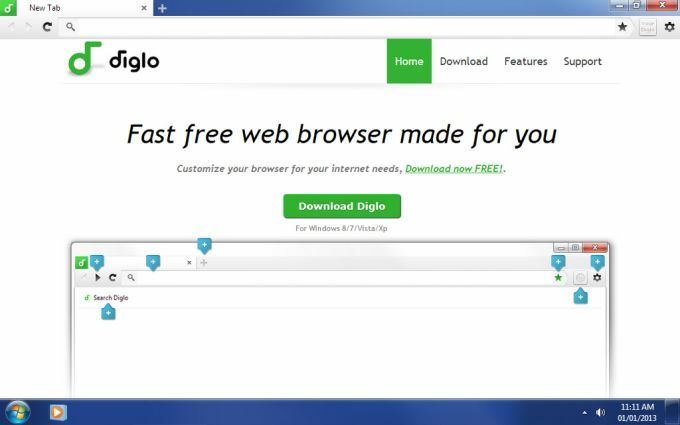 Diglo is easy to use and 100% free, also you get full access to download free Apps, Extensions and Themes that will make Diglo you favorite web browser. Diglo features four premade packages Sport browser, Social browser, Woman browser and Utilities browser. - Woman Browser - Made for the Career Mom, a place to find deals and discounts. With Diglo, users are able to access their favorite’s interests in a single spot. Diglo unique package themes make it stand out from the rest of web browsers out there. With hand selected themes, to provide the best browsing experience to most of the user. Designed to be ultra-fast and start up lightning fast. Loads websites in no time and handles web application extremely fast and stable. Diglo is optimal for everybody. And specially all those users that are have an interest in sports, social media and utilities, seeking to improve their workflow and don't waste any time to get what they need. use it; throw Chrome way. on this old machine..awesome!!!!!!!!!!!!!!! Dell 4300S; all were dogs; until Diglo.. Pros: the speed! the simple design. This product is GREAT! A definite "Must-Try" for all. . I'm a computer-class instructor/it mgr and have 25 or so computers on a network. We'd been using chrome and firefox both, and load times of web pages (despite our best efforts) were horrible. That is, until we met diglo! one computer, which was apparently very messed up, was loading pages in 3+ minutes, regardless of browser, so without doing anything else, i installed diglo on it. Page load dropped to under 10 seconds, most in less than 5! i went to all kinds of random pages i knew my students would not have gone to, results were the same. It is now being installed (wihout add-ons) as our default browser. There is scarce information about it on the web, but its great. What do you think about Diglo browser? Do you recommend it? Why?